Two weeks of skates, scrimmages, coach evaluations and nightly cuts later, three quarters of the competitors are assigned to team rosters, the smallest of which is the 24-spot Division I (DI) squad roster. While the DI team, like NCAA programs, recruits and makes commitments to players long before tryouts and returning players are, with rare exception, all but guaranteed spots, they are not excused from tryout participation — or excluded from the pressures that come with it. Hughes and his fellow D1 teammates’ participation is not merely for propriety’s sake. With a depth chart to settle and lines to be set, the tryout is plenty competitive, even for veterans. Above all, it offers the kind of high-speed training ground necessary to prepare for the season. Leblanc’s statement rings truer than ever before as the Flames D1 squad includes nine new players — more than one third of the entire roster. They utilized every scrimmage period, stickhandling exercise and skating drill of the tryouts to hone team chemistry and work toward filling holes and strengthening the weaknesses of their club. Handy, his coaching staff and players were confident by the end of tryouts that the team had more than addressed each issue. 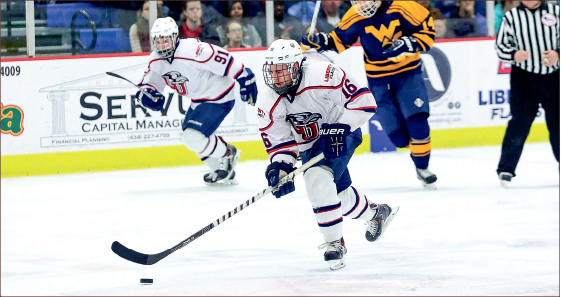 “This year we have size in the front and on the back end … and speed, which is a rare combination,” senior defenseman and team captain Matt Sherry said. Both Hughes and Leblanc agreed, listing the size and speed combination as two of the top three strengths of their team. Maturity would be the third and final element of this compelling trifecta. “It’s funny, because our freshmen are all older — probably older than most of our juniors, actually — so there’s a lot of maturity,” Sherry said. Raw physical ability will help the Flames for sure, but paired with the savvy to know the best way to put those abilities to use and the hockey IQ to learn a new system quickly, they make the team downright formidable. With the 2014 tryout period and subsequent training week — a series of grueling 6 a.m. conditioning sessions — in the books, the Flames have mere days until their season opener versus the Potomac Patriots Jr. A team. Ask any of them what their expectations are for the game and they will talk about a game-by-game mindset, consistency, execution and their personal excitement. Ask any of them what their expectations are for the season and they will unwaveringly say the same thing. Leblanc, Hughes and Sherry all agreed that the expectation is to win a national championship.